The 2018 WNBA season will run from May to early September and then the playoffs will begin. Here is a list of WNBA salaries for the 2018 season. Salaries for WNBA players are clearly spelled out in the CBA (Collective Bargaining Agreement) between the league and players. In addition to the salaries listed below, each WNBA player will also be paid a meal expense stipend of $79 for each day they are on the road during the 2018 season. Each team plays 16 road games during the 2018 season. If you figure players will be on the road for two days for each road game then each player will get around $2,500 in meal money. Players with 5 years of service in the league will each get their own hotel room for road games while players with less than 5 years of service have to share hotel rooms. Each WNBA player also get two tickets for each home and away game. Theoretically, players can sell their game tickets to earn more money during the season. Players can also earn bonus money as explained below the salaries for 2018. Also, each WNBA team can award up to $54,000 in additional Time-Off bonus money to try and limit how much their players play overseas. The entire $54,000 can be paid to one player to encourage her not play overseas this season or it can be split up among many players but $54,000 is the total maximum amount of this special bonus for the 2018 season per team. Women basketball players can and do earn higher salaries overseas than what they can make in the WNBA. Top women players can earn $500,000 or more playing in China for four months. There are also women's basketball leagues that pay well in Russia, Germany, Israel, Spain and Turkey. 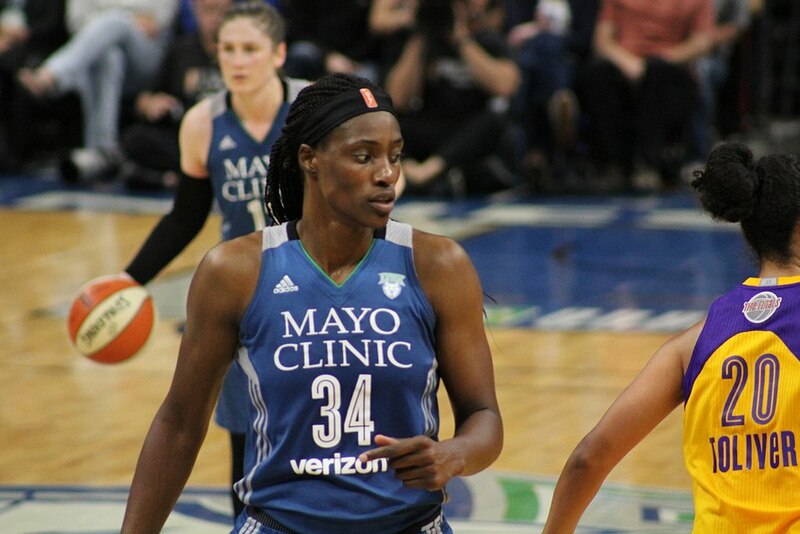 The maximum amount of salary a veteran WNBA player can be paid in 2018 is $115,500. That does not include any bonuses. Theoretically a team could pay their star player the entire $54,000 time-off bonus for the 2018 season too raising her salary to $169,500. The maximum salary a WNBA player who is not a rookie and not yet a veteran can earn in 2018 is $113,000. Again, theoretically a team could pay its entire $53,000 time-off bonus to a non-veteran player raising her salary to $166,000 this season. The minimum salary a WNBA player will be paid in 2018 for the entire season is $41,202. That is for players with less than three years of service. The minimum salary every WNBA player with at least three years service in 2018 will earn is $56,100. Rookies who were drafted in the first round of the 2018 WNBA Draft can earn around $50,000 this season. Rookies drafted after the first round will earn at least $40,000 in 2018. For the 2018 season, WNBA players can also earn bonus money for things like making the playoffs. Playoff bonuses range from $1,103 for making the playoffs and losing in the 1st round to $11,025 for each player on the team that wins the 2018 WNBA Championship. The 2018 WNBA MVP will earn a $15,000 bonus. Players making the WNBA First-Team will each get $10,000, while Second-Team players get $5,000 each. Another $5,000 bonus will also be awarded to each player who wins the Defensive Player of the Year, Sportsmanship, Rookie of the Year and Most Improved Player of the Year Awards. Finally, each player who participates in the 2018 WNBA All-Star game will get a $2,500 bonus. As far as comparisons between the salaries for men and women basketball players in the NBA and WNBA go, there is no real comparison. The best NBA players make more money in one game than any WNBA player could make in one season, but there are a lot of reasons why that is true. The NBA is far more popular than the WNBA and brings in a ton more revenue. But keep in mind that the NBA season is 82 games long and the WNBA season is only 34 games. NBA Playoffs series are best of seven games affairs while the WNBA only plays single elimination games in the first two rounds and then best of 5 series for the semis and finals series. So NBA players play in a lot more games than WNBA players do giving them greater opportunity to earn more money. What can be done about the pay gap between men and women basketball players? If you want to support WNBA players than go to WNBA games and watch WNBA games this season on TV and like this article on Facebook and Tweet it out regularly for awareness of the issue. Dam this bullshits out right abuse slave labor.